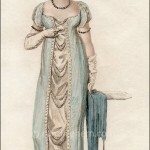 Journal des Dames et des Modes, Paris, February 20, 1811. I love all the detail in this print, especially the paisley shawl and the paisley detail along the bottom of the dress. 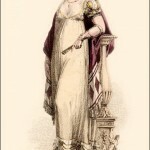 The dress is made of cashmere, a nice warm outfit for a winter evening. It may be hard to see online, but the hairdo is also wonderfully detailed, with intricate braiding along with the pearls and flowers. A large percentage of the French prints in my collection feature a shawl, not just as another accessory but as an integral part of the ensemble, and often held open in order to see the design. 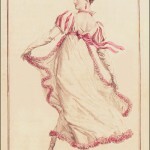 British prints often include a shawl as well, but they are never featured with the flair of the French prints. These shawls were very large, most often made of wool, and would have been essential in cool weather or drafty rooms. 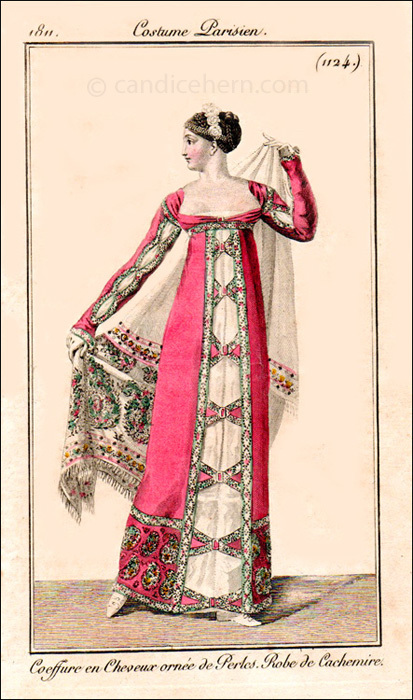 In this print, the shawl echoes the colors and design of the dress, and was clearly not just a random garment thrown over the shoulders to keep warm.